⇒In Shopkeeper Quest game, you can craft weapons, armor, and accessories. As you play the game or progress, you will unlock new weapon/armor/accessory blueprints. To craft these weapons, armors, and accessories, you need resources such as leather, stone, wood, and more. These resources are produced in the city or can be obtained from the quests. Tap the craft button and there you will see the list of available gears. Just below the gear name, you can check the number of resources required to craft. At the top of the craft menu screen, you can check the total number of resources that you own. ⇒Dealing with customers is pretty easy. All you need to do is tap the bubble message and then you will have to make the decision; suggest(if the customer is demanding the item that you don’t have at that moment, then you will see the sell button is grey. Tap the suggest button to suggest another item to the customer). Discount – You can sell the items on discount and earn energy. You can check the energy at the top of the screen. Smart Talk – It is another way to obtain energy in Shopkeeper Quest game. Surcharge – Surcharge option lets you sell the items at a high price. But it will cost energy. From the discount and smart talk, you can obtain energy. Refuse – If you don’t have the item to sell or you don’t want to suggest another, you tap the refuse button to reject the customer’s request. Sell – Sell the items for gold and energy. You will also earn EXP by selling the items. As you sell or trade, you will level up and new functions will get unlocked. This is where you interact with the NPCs who produce resources, provide heroes facility, investment facility, and many more things. Iron Mine – Iron Mine produces iron/stone. You can invest gold coins in this resource production department to increase iron production. Emerald Inn – When you send the heroes or after they complete the quest, they will go to rest or heal. You can increase the healing rate of heroes by investing in the Emerald Inn. Tanner – This facility produces leather. 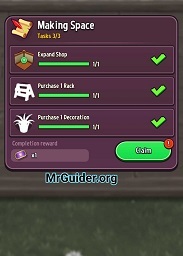 The leather is one of the items that you need to craft gears in Shopkeeper Quest game. Tailor – Invest in the tailoring department to increase the crafting speed. Blacksmith – Increases the crafting speed. Town Hall – Invest in the town hall to increase the city hall population. Lumberyard – Produces wood. Invest here to increase production. Carpenter – Invest to increase crafting speed. Training Hall – Invest to unlock new hero classes. Gardener – Invest to increase herb production. How to get heroes – Tap the heroes button -> add hero slot -> spend gold to recruit more heroes. You need heroes to send them on the quest and after the quest, they will bring resources. Hero Equipment/Skills/Level – When you send the heroes on the quests, they will gain EXP. At a certain point, their level will increase and as the level increases, attributes such as defense, the attack also get increased. Tap the hero -> in the info tab, you can equip the equipment. You can craft the equipment and buy from the trade house. Skills – All the heroes in the Shopkeeper Quest game have unique skills. At certain levels, heroes will get new skills. Keep sending them on quests. So this is the Shopkeeper Quest guide for the beginners. Let’s have a look at our Shopkeeper Quest tips, cheats & strategies! You should surcharge on the items that are quite expensive. If you spend the energy on low price items, it would not help too much. Also, do the smart talk, add decorations in the shop to get free energy. Don’t forget to invest in the city buildings/facility to get bonus production, hero classes, and other stuff. It’s important! In the shop, you have many furniture items such as racks, chest, counter, and more. You can increase the size, energy limit, storage, and more by upgrading these facilities. Complete the daily tasks for fortune key and other stuff. You can use the fortune key to earn some tokens or jackpot. You can spend the tokens in fortune tokens in the redeem section for hero gears or items. You can sell the items in the trade house or buy them from other players for diamonds or gold. Go to city -> trade house -> your trades -> sell. So these are some basic Shopkeeper Quest tips for the beginners. If you have more tips to share with other fellow players, comment below!